For sheer wow factor nothing beats our friend Rebecca's home cured salmon yet it’s so easy to do as long as you are prepared in advance. There are many curing marinade recipes which are easy to look up but try to use one with beetroot simply because of the dazzling purple reddish colour the salmon will turn once the curing process is complete. For taste once the essential salt and sugar are included the list of additives is almost endless, for example alcohol such as gin, vodka or tequila or citrus fruits and even treacle. Which ever route you follow cured salmon like it’s smoked cousin can be used in many ways - as a canapé, starter or to make more substantial dishes with pastas, salads and remoulades and will last in the fridge for about a week. Lay the salmon fillets, skin side down, on a board and brush your hand along it.If you feel any little pin bones pinch them out with your fingers or tweezers. In a bowl, mix all of the other ingredients for the salmon together to make the cure. By the way leaving the skin on creates a colour gradation as in the photograph which I prefer. For a more consistent hue however you can remove the skin. Stretch two large sheets of cling film over a work surface and spoon over some of the cure. Lay one of the fillets, skin side down, on the cure, then pack over most of the cure, and sandwich with the remaining fillet, skin side up. Top with the last of the cure and wrap both fillets together tightly with lots of cling film. Place in a container with sides, like a large roasting tray, put a smaller tray on top and weigh it down with a couple of tins. Leave in the fridge for about 30 hours turning over half way through. Don't be alarmed by the amount of liquid that leaks out, this is normal. You may need, to pour away the liquid. 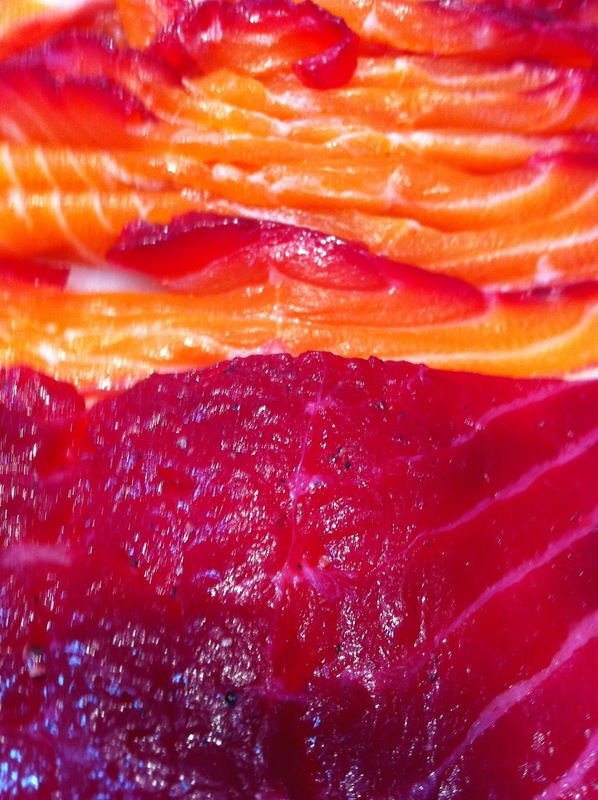 To serve, unwrap the salmon from the cling film and brush off the marinade. Slice the salmon into thin slivers depending on how you intend to serve it. 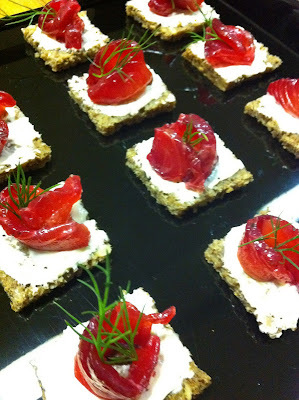 the canapes looks amazing! I`ve would really wanna have a excuse to have a party at home and hire you boys!